A glimpse at the film being made about the life of Hannah Nydahl – a Buddhist pioneer who with her husband Lama Ole Nydahl from 1972 helped to bring Buddhism to the West. The whole film will be available later in the year. 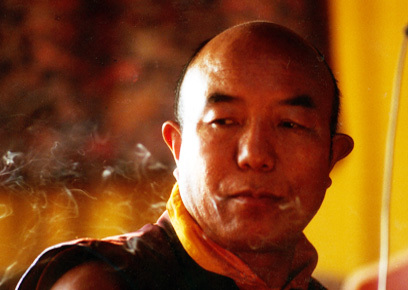 On March 30, 2012 at 3:24 am Nepali Time, the great and noble teacher Venerable Tenga Rinpoche passed away and entered his ultimate meditation of “thug dam” at his monastery in Kathmandu at the age of 80. Tenga Rinpoche was the Dorje Lopon – tantric master – of Rumtek Monastery in Sikkim and accompanied Rangjung Rigpe Dorje, the great 16th Karmapa, on several of his world tours. In 1979, the year he stayed in Denmark at the Copenhagen Diamond Way Buddhist Centre, he benefitted our growing Diamond Way Buddhist centers and friends through his undiscriminating and constant compassion and wisdom. We send our best wishes to his students and close ones at this time. Lama Ole Nydahl has asked his students us follow Tenga Rinpoche’s example by meditating even more, and he makes wishes that Rinpoche may return soon to a world that he will enjoy working in.